1. Although I’m pretty pleased that I haven’t had to use my Pattern Notes and Errata page in a while, the wee errors do sometimes slip through there occasionally, and I’ve begun an entry for Rendezvous. They are small errata, but there none the less. In the interim, I am going to try to work harder at the whole “being perfect all the time” thing, but I’ve heard that this might take a while. Further bulletins as events occur. 2. Yea verily I did what the internet told me and after starting my new socks yesterday morning, I am pulling the kid mohair strand from the outside, contained within a plastic baggie next to the merino sock yarn within my travel knitting bag, and it’s all going very well so far. The socks are actually working up pretty neat and I’ll be sure to post about this later. 3. At the Kitchener-Waterloo fair yesterday I ran into a couple of knitters who found this same Fleece Artist sock kit and bought it as a direct result of my enabling. I regret nothing. 4. 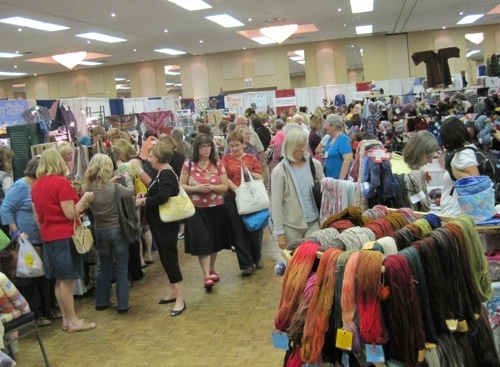 The Kitchener-Waterloo fair was great. It was pretty hopping, too, more so than I remember it last year. Apparently there was a line-up waiting to get in right at opening. 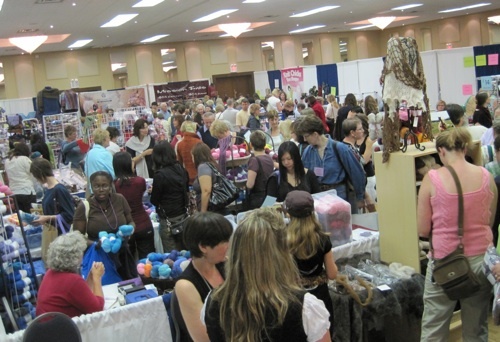 Inside the two vendor rooms was lots and lots of good stuff, and good people too. I believe the final count was around 80 Vendors participating, and they did not disappoint. It was wall-to-wall knitting and spinning supplies and lots of happy people with happy bags and armloads of things, in varying quantities. I ran into several friendly faces, including Lisa, Michelle, Theresa, Rochelle, blogless Elizabeth who I met in Ottawa in the spring, and probably several others who I am likely forgetting. I like that even though it’s a big event, it’s still pretty easy to find people you know and stop to chat at the edge of a corridor somewhere. 5. I bought some yarn. I bought more than I thought I would, which I realize in and of itself is not unusual for me, but I suppose I was felled by two things: First, the K-W fair and the Rhinebeck trip in October are the sanctioned yarn-buying times that I am allowing myself for the forseeable future. Second, I was, as of the beginning of the day, on a complete blank slate. I woke up and had no projects on the needles, for the first time in I don’t know how long. I think as a result, my brain reached for things I didn’t expect it to. 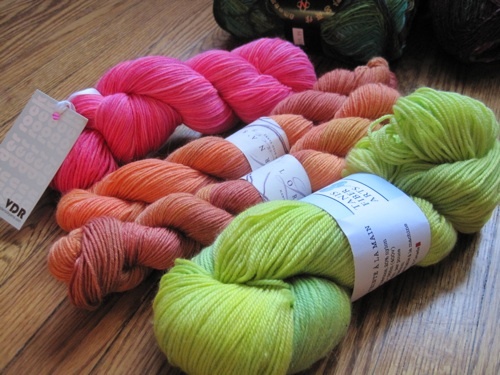 From left to right, these are Van der Rock yarns, Lorna’s Laces, and Tanis Fiber Arts. Van der Rock yarns are a relatively new Canadian outfit, run by two extremely adorable people. I encountered their booth at Sock Summit for the first time and was happy to encounter them again. I walked away with the pink skein above in “Neon” (all their colourways are named after elements from the Periodic Table, or molecules…you can have Arsenic green, Lead purple…good geeky knitterly fun), and really enjoyed chatting with them. The Lorna’s Laces Shepherd Sock (this one here is the ‘Satsuma’ colourway) was an (unsurprising) addition to my quest to have as many Lorna’s Laces Jaywalkers as I can knit (we’ve moved well beyond the goal of ‘a week’s worth’ now), in a variety of colours, and the Tanis skein is her new colourway called “Lemongrass.” It’s so bright it had to come home with me. 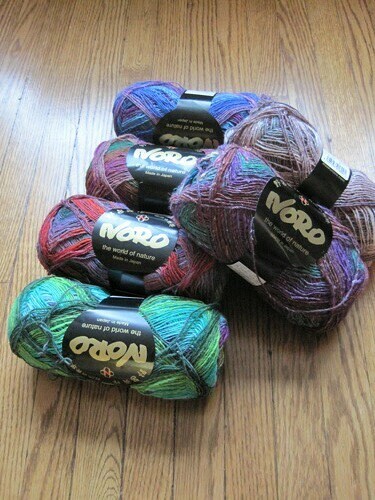 Also, I bought Noro sock yarn. I have no explanation for the fact that I brought home 6 skeins of it (2 silk garden, 4 Kureyon), other than that it was on my list for sock knitting this winter, there were lots of sales, and I am helpless. Also, even when there is blue, it’s not just blue, so that totally is allowed in the not-blue rules. I may have also bought a few bits of spinning fibre. Maybe. I’ll save that for later. Today I’m going to continue knitting my new sweater, and ponder what I’m going to do with my new acquisitions. Fun times ahead for Sunday. I hope you have a good one! What a huge fair! You must show your spinning stuff too, I am totally obsessed with spinning at the moment! LOVE your new yarn! I might have followed you down the same colour pathway. Those are colours I definitely can’t buy enough of! Glad to see you took control over the blue yarn and branched out. Lovely haul! Love that neon pink yarn! How totally fabulous will it be to have that color on your feet in the middle of winter? you bought Noro Silk garden to make socks with…..where do I find a pattern I can use? I have 5 balls of the stuff and didn’t know what to do with it but now I think I know…. But I want to stand right up and say that I wholeheartedly object to anyone aiming for perfection. It is overrated and leads to spending too much time fiddling with things, not putting perfectly good ideas out there (as knitting patterns or anything else), and means that you are always in danger of judging yourself as coming up short instead of enjoying your undeniable talents and the compliments they earn you. Here’s to more wonderful knitting patterns for which we have to check the errata pages for a few minor things! All so pretty! I really really love the Tanis yarn. Fan-bloody-tastic colour!! It looks like so much fun! And lovely haul as always. Thanks for the shout-out Glenna. And if you need any help deciding what to do with that Noro, drop me a line. I recently discovered rigid heddle looms – it turns out that while they will eat any yarn, their preferred diet is Noro sock. As one of the enabled knitters I’m not sorry either!! I’m actually starting to regret getting only one colourway of the lovely smooshy socks!! Looking forward to the fibre report as well! I feel so famous to have merited a blog mention! It was so nice to run into you on Saturday. I seriously contemplated buying one of those kits, and all because of you. You should probably count that as well.